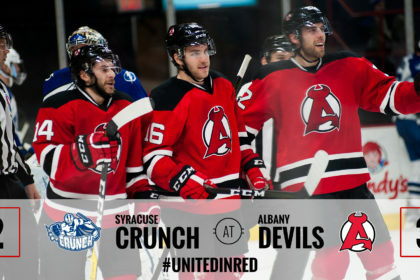 ALBANY, NY — The Albany Devils took down the first place team in the North Division, the Syracuse Crunch, with a 3-2 win Thursday at Times Union Center. 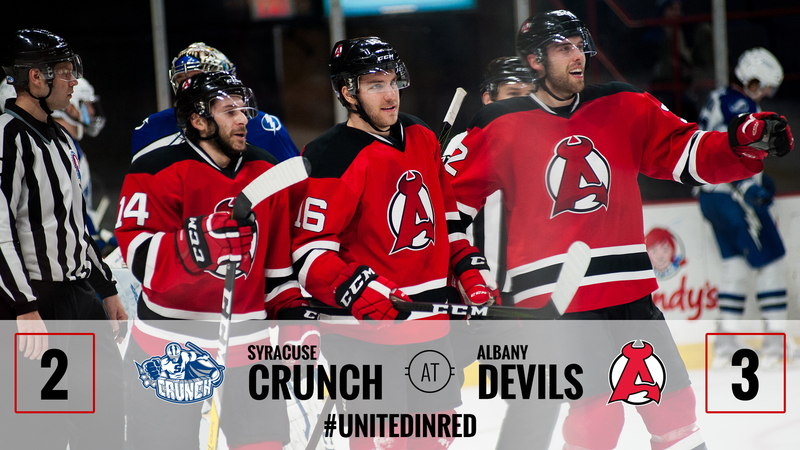 The Devils are now 2-2-0-0 through four games against the Crunch this season. 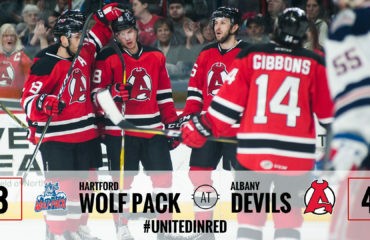 Albany’s overall record improves to 26-17-1-1. Syracuse’s record moves to 22-13-2-5. Nick Lappin opened the scoring at 14:27 of the first period. The tally was his third of the season with Albany and second in the past two games. Josh Jacobs and Jan Mandat provided the assists. Brian Gibbons and Ben Sexton furthered the Devils’ lead in the second period at 2:17 and 6:53, respectively. Gibbons netted his 10th goal of the season which moved the lead to 2-0 and was unassisted. Sexton responded shortly after, redirecting a Blake Coleman shot to push the score to 3-0. The tally was his 14th of the season which ties him for the team lead with Coleman. 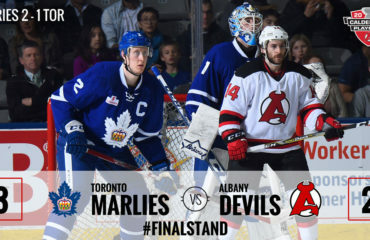 Yanni Gourde and Tanner Richard erased the Devils’ three goal advantage with two unanswered goals in the third at 7:03 and 14:37, respectively. Ken Appleby stopped 25 of 27 shots for the Devils. Syracuse netminder Kristers Gudlevskis made 21 saves on 24 shots. 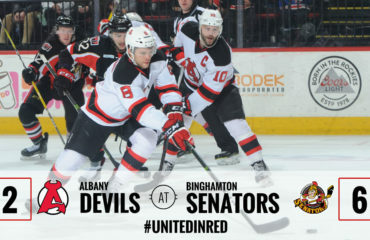 The Devils host the Lehigh Valley Phantoms Friday for a 7 pm puck drop.